ModernTribe has spawned its first marriage! Jill (Editor) and I (Jeremy, Director of Affiliate Programs) are engaged. After we'd dated for about two years, and several months after Jill knew we should get married, I too realized that. 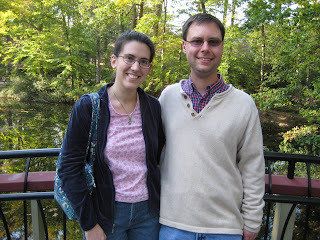 We'd planned a trip to Jill's alma mater, William and Mary, so that seemed like a nice occasion for the proposal. My alma mater, Miami University, had a tradition that if you kissed under the Upham arch at midnight, you'd get married. I wondered if William and Mary had something similar, so I asked Jill in general terms about campus traditions. She mentioned one, then said there was another but she would not tell me about it. I looked online and confirmed my suspicion: legend has it that if you kiss on the Crim Dell bridge, you'll get married. Jill had told me she wanted to help pick out the ring after we got engaged, so I thought a little gift would be nice. I chose ModernTribe's hamsa with two golden birds (kawaii!) to represent us. It arrived in the nick of time! At William and Mary, it was a nervous day (for me!) of walking around the campus. Finally, we made it to the bridge. We took pictures then kissed...and kissed...and kissed...I was mentally all set to propose, but hadn't realized how awkward kneeling would be. After yet more kissing, I thought it'd be less awkward if I took her hand as I knelt. I knelt and my little spiel was unremarkable, but the look on Jill's face was total shock. When I asked her if she'd marry me she said simply "yes" and we went to sit down and recover. She asked, shaking, if I'd known about the tradition and I told her yes. I gave her the hamsa and she loved it. Now we're planning the wedding for this fall. Wish us luck! Though this is a late time to post a comment I stumbled upon the page and enjoyed reading it, congratulations to the couple. Thanks! Actually we did go to Miami and kiss under the Upham Arch too, so we should have full blessings. :-) Thanks for letting me know about the Bicentennial celebration!